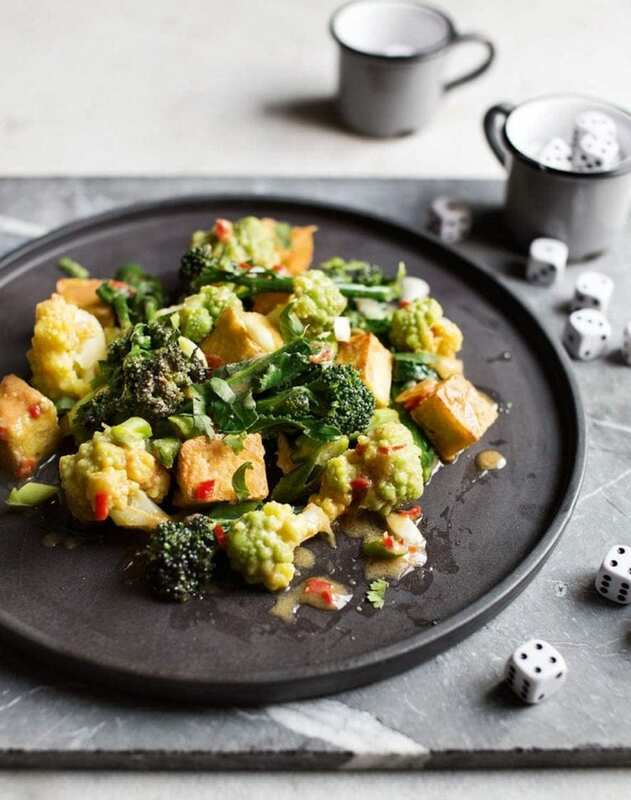 This salad is healthy and beautiful, the bright romanesco florets bring a unique beauty and crunch to the miso seasoned tofu. Heat a layer of vegetable oil in a non-stick frying pan, then fry the tofu for 4-5 minutes, turning, until golden on all sides. Drain on kitchen paper. Steam the romanesco and broccoli in a steamer or colander over a pan of boiling water for 3-4 minutes until just tender. Meanwhile, heat a little more oil in the pan and gently fry the garlic, fresh ginger and sliced red chillies for a couple of minutes. Add the white miso paste and a splash of cold water. Stir in the chinese rice vinegar and soy sauce. Toss the just-steamed vegetables into the warm miso dressing with the drained tofu, spring onions and roughly chopped coriander, then serve straightaway. If you can’t find romanesco, use caulifower florets – quickly blanch instead of steaming. Make the dressing up to 2 days in advance, store in the fridge in an airtight jar, then reheat before mixing in the freshly steamed veg. Romanesco is the most unusual of brassicas, its tightly packed, lime green conical florets giving it a slightly alien appearance. It can be used in place of either broccoli or cauliflower as the cooking time is the same. Fancy getting a copy in print? Delicious magazine is a part of Eye to Eye Media Ltd.
Now you can stay up to date with all the latest news, recipes and offers. Subscribe to delicious. today for just £13.50 – that's HALF PRICE!